Outsource Equipment provides superior warehouse rack repair services for pallet racks and other warehouse shelving and warehouse racking solutions. 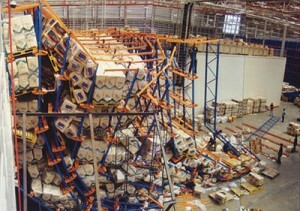 The collapse of pallet racking can result in damaged goods, lost wages, expenses and unnecessary injuries! We repair and protect your damaged racks – whether the damage is below, at or above load beams. High-quality materials such as RackmaX II pallet racks. Nationwide installation available – install in minutes. Pallet racking repairs save you about 44% compared to replacing. Repair is 3 times faster than replacing frames. Repair provides future impact protection. Repair allows for fewer pallets to be moved. Repair comes with a great warranty. Notes: Frame replacement is based on a typical example of one frame with 4 beam levels and 96” beams. 18 pallets need to be moved twice (unload and reload) = 36 separate operations involving customer’s labor and equipment. Assuming each operation takes three minutes, for a total of 1.8 man hours (1 man, 1 forklift), at $60 per hour. Repairing reduces the number of pallets that need to be moved to 2 pallets at floor position. This equals four separate operations equal to 12 minutes when a rack lifting jack is used. Current prices as of February 2013 for a 42”deep, 24’ tall, 12-gauge standard 3” x 3” tear drop frame FOB in Kentucky (larger quantities will be discounted). Approximate cost for a 36” damage height. Scissors lift will be required to comply with the OSHA 6’0” rule. Price is based on typical weekly rental price plus pick-up and delivery and divided by 35 frames to be replaced in one week. Approximate cost per frame for contractor to do replacement (providing frame has no in-rack sprinkler or is not part of a module with pallet flow components or a push back system). Price is based on replacing seven frames per day with a two-man crew and typical daily labor rates for one foreman and one experienced laborer. Price based on typical local installation. For more information on pallet rack repair, you can read more about it on our Blog »» Outsource Equipment provides superior warehouse rack repair services for pallet racks and other warehouse shelving and warehouse racking solutions. We deal in the supply and repair of all types of pallet racks and warehouse shelving, from push-back rack to cantilever rack to everything else – both new and used pallet rack. Contact us about pallet rack repairs today!